Way back in 2010, I celebrated my first Thanksgiving abroad with other expats. Over time, I lost interest in spending time with people who I had nothing in common with aside from the country issuing our passports. For the most part, I’d let Thanksgiving go, at least temporarily. Robert’s parents are visiting from England next weekend, and we’re celebrating Thanksgiving! In the absence of Tofurky and stuff-able winter squash, I’ve had to go a more basic route for our vegetarian Thanksgiving entreé (Robert’s mom is kindred spirit and also a vegetarian!). I’ve been auditioning vegetarian nut roast recipes this past month and last night, in the nick of time, I finally nailed the vegetarian nut roast recipe I’m going to serve. 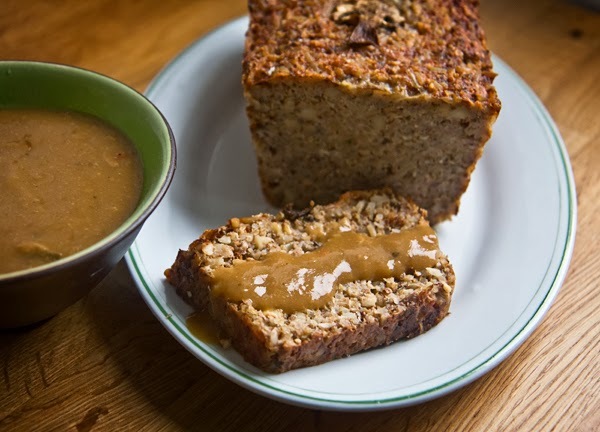 If you’re looking for a delicious Thanksgiving vegetarian main dish, I don’t think you can miss with this vegetarian nut roast recipe. It’s so good, we were eating it cold for breakfast! Toast the walnuts and almonds on a baking sheet for 10 minutes or so at 190°C (375°F). Allow them to cool a bit, then finely chop them. Finely chop the onions and sauté them in a bit of oil, meanwhile chop the mushrooms until they’re pea-sized. Once the onions are translucent, add the garlic, mushrooms, marjoram, thyme, and sage. Continue to sauté until the mushrooms are golden. In the biggest bowl you’re got, stir together the nuts, rice, onions and mushrooms, emmental, cottage cheese, salt, and pepper. Stir in the eggs and mix until it’s well combined. Line a loaf pan with parchment paper, leaving extra around the edges to help lift the nut loaf out of the pan later on. Oil it, and pour the mixture into the pan, smooth the top with a spatula and knock it on the counter a few times to settle it in the pan. I laid a few mushroom slices down the center to make it look rustic and pretty, then I baked it for an about hour at 190°C (375°F), and let it cool in the pan on a wire rack for about 20 minutes. After it cooled a bit, I lifted the parchment out of the pan, onto a serving platter, and peeled it from the roast. Heat the oil in saucepan over medium heat. Add the onions and the mushrooms and sauté until the mushrooms are soft and the onions are translucent. Regarding the mushrooms… I just chopped up what was leftover in the package after making the nut loaf, which was about 100g. Add the garlic and sauté for a few more minutes. Take the pan off the burner and whisk in the nutritional yeast, flour, and soy sauce until it’s smooth and lovely. Move it back to the burner and whisk in the veggie stock. Stir in the black pepper and the sage, bring it boil, reduce heat, and cook it at a simmer, whisking constantly until it thickens. Next… the best homemade cinnamon ice cream recipe, ever!